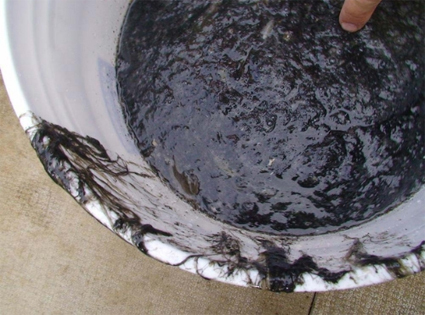 This huge blob of arctic goo is nearly 12 miles long. 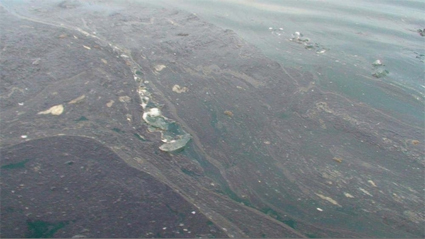 Have you heard about the huge blob of arctic goo that is floating in the Pacific Ocean near Alaska? Oh yeah. It’s true. And apparently this huge blob of arctic goo is nearly 12 miles long. Furthermore, it’s not garbage. It’s not oil. Nobody knows for sure what this goo is. Call it crud, gunk, goo or whatever you want. Now matter what you call it, there are globs of this goo for a stretch of 12+ miles near the North Slope Borough of Alaska. The brownish-blackish arctic goo could be algae. Interestingly, witnesses have seen a jellyfish tangled up in the goo. Gordon Brower, of the North Slope Borough’s Planning and Community Services Department, says someone turned in a dead goose – just bones and feathers – that was apparently found in the arctic goo. Weird, huh? It’s probably some sort of algae of some sort, but this arctic gunk is definitely a mysterious story. I’ll update the post when I find out more. By the way, because they are finding dead animals in this goo, I couldn’t help but think of the 1987 movie Creepshow 2. In this movie, there were 3 stories, and one of them was called The Raft. If I remember correctly, all 3 stories were written by Stephen King. The Raft featured 4 people stranded in the middle of a lake, and there was some sort of gooey blob in the lake. I was able to find the movie on YouTube. Check it out if you want. It certainly brought back some memories for me. These types of movies terrified me. Recovered: Air France Flight 447 Voice Recorder & Flight Data Recorder!